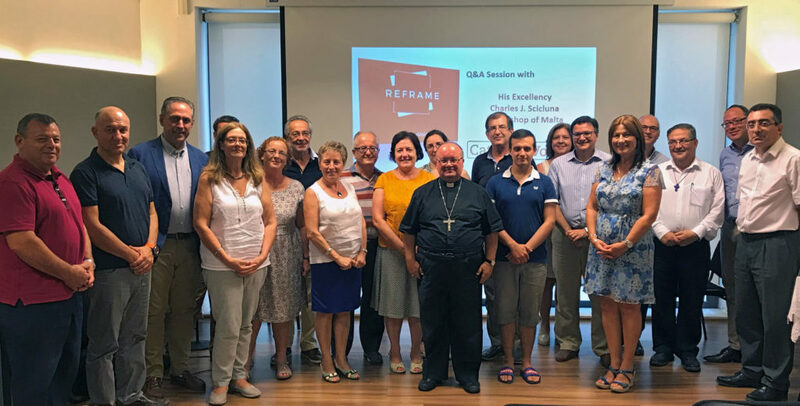 Following the training of over 25 lay persons Catholic Voices Malta joins the Catholic Voices international team, a network of 21 countries spread all over the world. The group, concluded a training program supported by Catholic Voices UK and includes lawyers, home-makers, members of the medical profession, educators, entrepreneurs, a social worker, an architect and a psychologist amongst others. Catholic Voices embraces the challenge that Pope Francis makes to all the laity: “Given today’s “throwaway” culture and so many problems unfolding in the world, “Do I as a Catholic watch from my balcony? No, you can’t watch from the balcony. Get right in there!” Pope Francis, 30th April 2015. Recent surveys have shown that 94% of the Maltese population still identify themselves as Catholics. Catholic Voices Malta seeks to represent their voices, aspirations and the values, for the greater good of all Maltese society. Speakers from Catholic Voices are available to participate in news and discussion TV and Radio programs, debates and other forms of engagement with society. Producers and broadcasters can invite our participation by sending an email to info@catholicvoices.mt. It would be our pleasure to meet you. Catholic Voices will also start a series of training courses in parishes to inform better Catholics on the positive message and relevance of Church teaching to today’s society. My husband would like to offer our support to your cause. We are not the type to speak in front of a group but we firmly believe that catholic values and morals are being undermined and that there is a real need to counteract this. We believe that there is strength in numbers.